Have Bookmyshow Gift Card to Sell? Planning to shop from Bookmyshow ? BookMyShow Gift Cards- a great gifting option! India’s first and biggest ticket booking platform, BookMyShow brings more than 4000 screens in over 400 cities of India at your fingertips. It also lets you book tickets to music concerts, plays, comedy shows, games, and all other kinds of events from a single platform. Now if you are unsure of what to gift your friends or family members at their birthdays or anniversaries, BookMyShow movie voucher are one of the best options at your disposal. From movie buffs to sports lovers, everyone will love receiving a plethora of options in the form of vouchers. A big advantage of purchasing BookMyShow movie voucher on Zingoy is that you can earn instant cashback on them. This amount can be as much as 12.5% of the BookMyShow gift card value. In case, you have landed with a BookMyShow voucher from somewhere, you can sell it on Zingoy if you don’t want to use it yourself. Just use the Sell Gift Card tab given on the top corner of this page. The fact that all the numerous BookMyShow egift cards are available on a single platform, on Zingoy, makes it a particularly attractive destination for folks on the lookout for BookMyShow gift card offers. Moreover, Zingoy works really well not only when accessing it on the desktop but also on mobile devices; there is both a mobile app as well as its dedicated mobile site. That way, even when you are on the move, you can easily look up and purchase the gift card of your choice. How to use BookMyShow Vouchers? Redeem the voucher directly at the time of making a booking. Just enter the gift card code on the Gift Voucher tab on the payment page. In case the gift card balance is less than the amount of the booking, then you can pay the remaining amount using a debit/ credit card or net banking or online wallet or MyWallet balance. Add the BMS gift card to your BMS account to use it later. 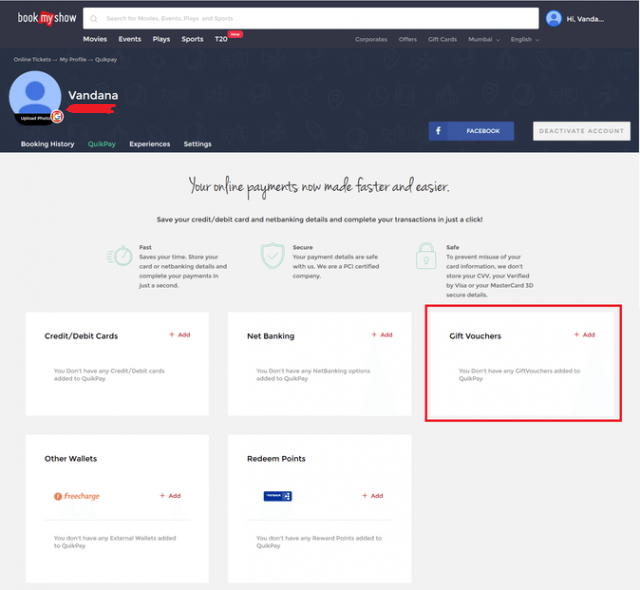 How to Get BookMyShow Vouchers added to your account? Log in to your BookMyShow account. Go to the icon of your account given in the top right corner of the page. Click it and select 'QuikPay' from the drop-down menu. On the QuikPay page, when you scroll down, you will find the gift card section. Click 'Add Gift Card', enter the details and you are done. Steps to use BookMyShow Gift Vouchers? You need to first activate the BookMyShow discount voucher you have received before using it. Once activated, the gift card will be valid for 12 months from the date of activation. BookMyShow gift cards can be partially redeemed and redeemed multiple times within the validity period. For a single booking, you can redeem upto 5 BookMyShow gift cards. You can buy BookMyShow gift card with a debit/ credit card, net banking or online wallets but not with BMS Credits or gift card balance. How to Activate BookMyShow Gift Card? If you received the BMS gift card via email directly from BookMyShow, then you have to click the link given in the email to activate the gift card/s. If you have received or bought the BookMyShow gift card from its partner sellers i.e. stores outside BookMyShow, then it can be activated by other means such as SMS. Please refer to the instructions given in the email or on the physical gift card for activation. Generally, you can activate it by sending ACTGV <16 digit gift card code> to 9239895050. You will find the information on the Gift Cards page of BookMyShow. 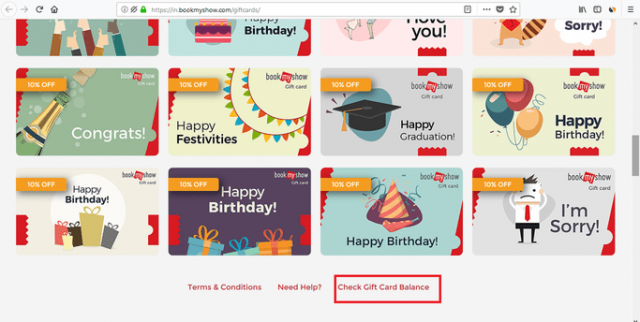 How to Check BookMyShow Gift Card Balance? If you do not remember or know your BookMyShow gift card balance, you can easily check it on the BMS website. On the BookMyShow website, click 'Gift Cards', given on the top menu bar towards the right-hand side. Click on it, and enter the gift card code to know the balance. It is the perfect gifting option when it comes to birthday, anniversary, wedding or any function as Bookmyshow gift vouchers is something special for your friends and relatives who like to watch movies, events, tv shows, sports etc. Now you can not only just buy the gift cards but also can sell the Bookmyshow gift vouchers on Zingoy. BookMyShow gift card offers are available online on all Bookmyshow vouchers from 0 to 2000. Bookmyshow gift vouchers can be only used at Bookmyshow stores.